This is a great all-in-one workstation for the studio or home! The adjustable, double mast easel tilts forward for pastel work. 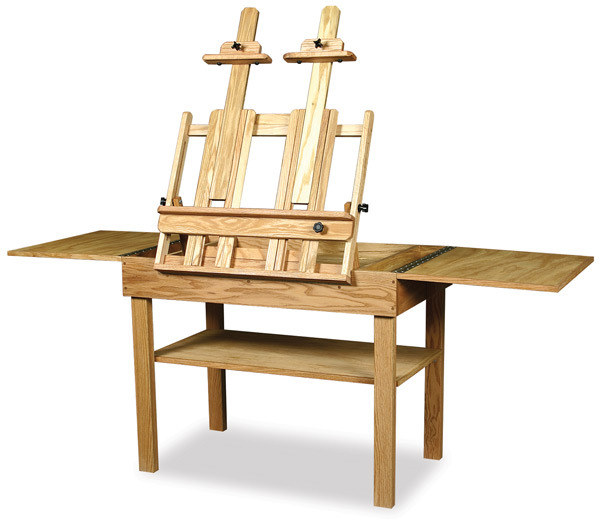 Lay the easel flat, extend the wings, and you have a flat work space suitable for full sheets of watercolor paper or other projects. Ideal for any medium, the easel accommodates canvases up to 39" (99 cm) in height. The maximum easel height is 75½" (192 cm). The taboret width is 80" (203 cm) with the wings open or 40" (102 cm) with the wings closed. A 38" × 19" (96 cm × 48 cm) lower shelf and two 4½" × 21" (11 cm × 53 cm) storage compartments hold supplies. Made of solid oak and oak panel, the Becky Taboret is finished on all four sides, so it looks great even in the center of a room. Some assembly is required. Weighs 97 lb (44 kg).